Sailing 49ers and 29ers at the best of times isn’t easy. Once it becomes more of a second nature after a few years in the boat, it becomes difficult to remeber the struggle we all went through in the first few months of starting out. As a crew, I’ve often taken it for granted where my role starts and finishes and where the helm takes over. It can be easy to get set in your ways and always focus on improving the big things (boat speed, tactics, etc) and ignore a lot of little things that can make every one’s life easier. Therefore, I thought I’d start a series of posts that look at ways of making your partner’s life easier (and therfore the boat faster). Today, I’ll look at it from the crew point of view. What is it that crews can do to make their helm’s job that little bit easier? 1: Food: Eating properly is essential between races to keep the team focussed and alert. 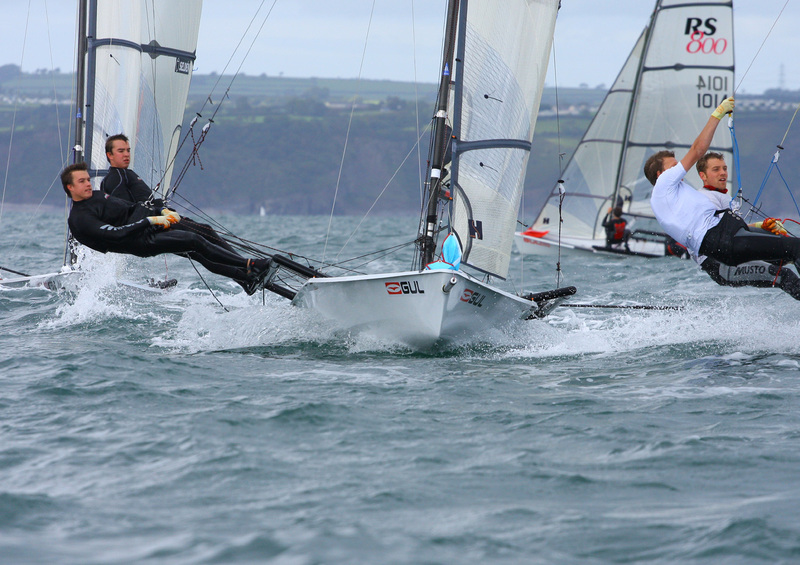 However, helming a 49er in big breezes whilst trying to peel a banana, open a drink or unwrap a powerbar can be tough. Therefore, do your mate a favour and unwrap it for him. Sometimes a few little things can make all the difference. 2: Timing: Simple really. Even if the helm does his own time keeping, having a watch counting down will enable you to call out the time to the start when your driver gets into a flap. 3: Balance: When trhowing the boat around on the start line, it can be surprisingly easy as a crew to just let the helm get on with it and to keep your head down. However, this is rarely helpful. Keep your head up, call out boats moving into your blind spot (depending on how your helm stands this can vary. For us, it’s on the stern leeward quarter as justin faces forward) and help to keep the boat flat. For example, when we throw it into reverse (backing the main and stuffing the bow into the breeze) the boat will always heel heavily to windward. sure, the helm would normally have to keep this flat, but it makes so much sense for the crew to throw their weight around to flatten it off. 4: Standing up: I see far too many crews sitting down and taking it easy pre start whilst the helm fights to keep the boat flat. Whilst you need to get your weight as far forward as possible when you’re parked, you should never stay static when you are manouvering. Therefore, always stay on your feet, ready to react when the boat needs to be flatter. However, be sure to get back to your crouching by the mast position when you park up again. 5: Communication: Be sure to give as much feedback as the helm needs. It’s easy to go quiet and to lose focus on those long upwind legs in light winds, but this is never going to be fast. Whilst your helm is driving the boat and focussing on the telltales, be sure to keep your head up to spot the breeze and to track the rest of the fleet. 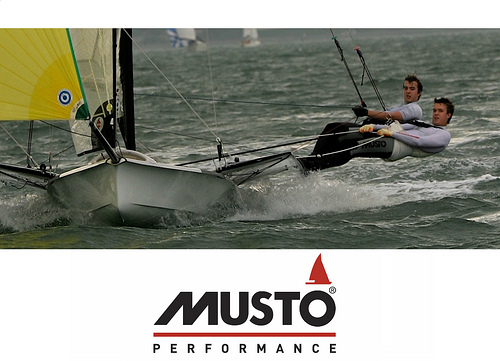 6: Safety gybes: In the breeze, gybing a 49er or 29er is tough for the helm so be sure to make it easy for them. Always try to be obvious with your movements, don’t rush and try not to change your routine. You need to keep as many things the same as possible, as suddenly changing the speed you cross the boat or your routine is a total nightmare for the helm who is already trying to work out how he’s going to keep his hair dry. When it’s really windy, the number one reason for capsizing is from the power coming on too quickly after the boom comes across. If the spinnaker blows forward of the luff you know you have issues, so a safety gybe (pinning the old spinnaker sheet in until the boom has crossed) is a great way to give your helm some time to find his feet on the new side and to prevent the power from piling on too early. 8: Being a spare pair of hands: I know it sounds simple, but you see a lot of helms struggling to untangle ropes, hook on, uncleat the jib if it’s locked in, or do anything else that’s tricky with one hand. Always keep an eye on him, as his number one role is steering in a straight line so fiddling with ropes in counter-intuative. If he looks like he has an issue, help him out. 9: Bear aways: During a windy bear away the helm has a lot on. Therefore, you need to make his life as easy as possible. By taking the mainsheet, you effectively have the hardest job during the turn; to manage the power to stop the bow driving in. When it’s properly sketchy, you’ll end up easing armfuls of mainsheet to completet the turn. However, far too many crews then just ditch the fully eased main onto their helm and run in to sort the kite out. This is a huge error, as your mate is now standing all by himself (billy no mates) trying to sort his life out. With only one hand (which is very often holding onto the handle), how is he supposed to pull 2 meters of mainsheet into the boat? To make his life easier, be sure to drag the mainshett back in again by about an armful before handing it across. It really does make a world of difference. 10: Don’t be a jerk: Yes, crews get victimised all the time. Yes, I’ve been shouted at for helms dropping their tillers, hitting marks or forgetting their starting watches (never by JV by the way..). Yet, the final and almost most important tip is to not be “that guy”. Everyone has sailed with “that guy”, the one who always points the finger, decides who was at fault or just generally takes it far too serious. Being a crew, I think it’s essential to never try to get back at the helm for a mistake. Helms are under a hell of a lot of pressure, and ultimately will take the blame for a bad series, so they are naturally defensive. If something goes wrong, always be the guy who puts forward positive ideas for gaining those places back, don’t get stressed when thigns go wrong, always look forward to the next opportunity rather than back at missed ones. On the water is not the place to argue out your differences, so be positive and talked about it later. this is one of the biggest improvements any crew can make to their game.